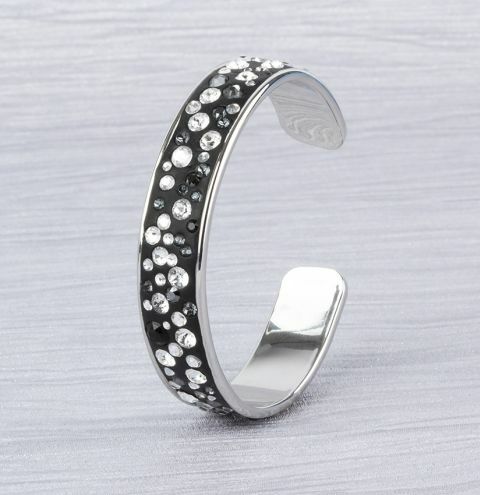 Learn how to make the stunning crystal embellished bangle using black Swarovski Ceralun clay and a sparkling Swarovski crystals. Mix approximately half of the Ceralun following the instruction guide until the two parts have completely blended. Roll the clay into a long pencil shape, cut in half and start to apply pressure to the clay onto the bangle base. Make sure you spread the clay evenly and to the edges of the base. Apply the second half of the clay to your bangle base. Make sure the clay doesn’t overlap onto the outer edge of the base. You may want to use a craft knife, your nail or a cocktail stick to go around the edge of your bangle base to gently push or cut away the excess clay. Apply your crystals by pressing them into the clay until the edge of the crystal is level with the clay. Once you have finished set the bangle base aside and leave it to dry for 72 hours.